The mental images we develop of places we’ve never been are the first casualties of travel. Nothing is ever really how we imagine. The warm southern states I pined for during 39 winters in the Northeast are one such illusion. We’ve discovered that reliable winter warmth can only be found by traveling to the farthest southern reaches of the country; or by leaving it entirely. Of the two, the second option is more desirable. There are just too few places in the U.S. to explore during all those long winter months. Southern Florida was great and Texas, well, I’ll have more on that later, but we’re really not keen on returning to the same couple of places year after year. Next winter we’re considering jetting off to South East Asia. But yesterday’s BBC article about aurora borealis chasing has me rethinking those long-term plans. Seeing the Northern Lights is high on my to-do list and the next two years promise peak activity. Unfortunately winter is prime time viewing owing to extraordinarily long nights. It’s also prime time cold. So can these two hot-house flowers withstand arctic conditions to witness one of nature’s greatest displays? Probably not. But we’re thinking about it. 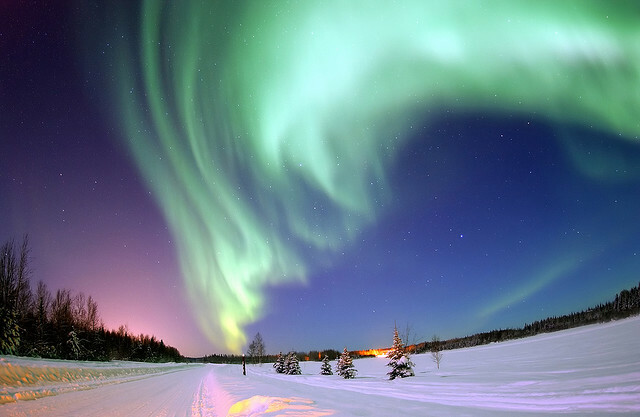 Seeing the northern lights is also high on my travel list. I find it interesting that I’ve been to almost all the places you’ve blogged about in recent months. We evidently have been following the same roads and share the same dreams. We’re pretty much doing a tour of U.S. highlights. I figure at our pace it will take about four years to complete. But it’s not surprising that an active U.S. traveler like yourself would have covered a bunch of the same ground. What do I think? I think you’re right. I made the comment just this morning that Texas and Arizona are simply not warm enough for us, and Florida is too busy. Mexico is perfect for us, although we also have plans of Asia and South America. I can see why Florida is busy. We had a really terrific time there last winter with plenty of stuff to keep us busy for three months. Shannon wants to get back to Key West, and I can see doing that but the drive there and back from out west is a killer. I think you guys have the right idea, though. Taking the RV into Mexico is something we might just have to look in to. I figure it is dark enough in Fairbanks by October LOL. There are several viewing places that are inside under glass. You’re probably right about October. I’ve also seen stories about igloos with glass ceilings so you can watch the Auroras from the comfort of your bed. That sounds like our speed. Although if I want photos, and plan on sharing them here, I’ll have to stand outside next to a tripod waiting for the show. Highly recommend the Northern Lights. To see and hear them is truly spectacular. Chena Hot Springs north of Alaska has the Aurora, indoor hot springs (glass all around) to warm up in a rural setting. Of course, Anchorage will not be as cold and, if you go in February, you can enjoy the 2 week-long Fur Rendevous (2012 will be the 77th year) which includes the World Championship Dog Sled Race (three days of starts from downtown). http://www.furrondy.net/. Lots to see and do, from cultural and art events to kind of crazy events (outhouse race and snowshoe softball). Lots of folks from all over the state come to Anchorage for those two weeks so plan in advance for any housing. If you live in Alaska, by February you are really ready to get out of the house and have some fun and Fur Rondy provides it. It’s true you could also go to Alaska, but I’m pretty sure that the costs of an Alaska trip are MUCH more expensive than Iceland. I’d bet transportation inside Alaska is very costly. So, you didn’t mention going to Southern California during the winter and I’m wondering why? The temps in southern Cali are probably sunny and in the 70’s for the majority of the year, especially along the coast (San Diego for example). I’ve been in New Orleans for the past 2 weeks, and I’ll be here another week and on the nice days the temps have been in the upper 70’s, with one day reaching toward 80. On the cooler days it does get down to the 50’s, but it’s not cold like winter, it’s just a bit chilly. The weather here is very changeable and there seems to be a lot of cloud/sun mix days in December. New Orleans is a great city to visit, and I’ve got more than a dozen posts on my blog about my experiences here – please do check them out if you’re considering heading this way. The other very real possibility for you guys is Mexico, except if you’re going to drive, you’ll have to pass through all the border areas first to get to the more southern parts of Mexico that aren’t on the State Department warning lists. There are a lot of fantastic things to be said for Mexico, and Central America in general. If you’re thinking of that direction, please check out the Trans-Americas blog (if you haven’t found it already) because they’ve been doing the wandering traveler thing in North and Central America for about 5 years now. Okay, that’s it for suggestions. I hope you both had a phenomenal Christmas and a wonderful New Year to come. Thanks for all the info Carol. Iceland has been on our wish list for a while. We considered flying there a couple of years back when the Krona tanked and it became dirt cheap. That plan never came together, but the country is still on our radar, and obviously on our long to-do list. We probably will hit Southern California next winter or the following one. I’m just not sure we’ll have enough to keep us busy, though. We pretty much exhausted the entire state of Florida – from St. Augustine, to Key West; through the Everglades and Miami, around the Emerald Coast to Pensacola, in one season. There’s a lot in California, too, but we’ll be much more limited in just the South. Temperatures in the south would definitely be more agreeable if we didn’t live in an RV. 50 degrees is pretty tolerable as an outside temp. Inside it is kind of unbearable. Our heaters run pretty regularly when it’s 50 outside and they run almost non-stop when we have a hard freeze. I haven’t spent the winter in New Orleans, but it’s about the same longitude as Houston. I know when I flew out of the Houston airport early this December I had to scrape ice off my windshield. On other days, it’s back up to 70. This past week 40-50. Hmmm, well given that New Orleans is right on the coast, they’re probably getting milder winter temperatures off the gulf. I don’t know if they get ice in Jan or Feb, but I can say for sure in December this year there was no way for ice to form, it never gets down to 32 degrees here. I’ve also heard from locals that they never get snow. Here is the Trans-Americas posting on “How to Have a Mexico Road Trip” and it is all about the experience of driving in Mexico. When I was in Mexico I didn’t take a car and the amazing bus system in Mexico works really well. That said, it’s tough to be truly mobile in Mexico without a car. We took buses to get to the Pyramid outside of Mexico City. The rail (above ground) also was excellent. Crowded, but very accessible. We went to northern Finland in October a couple of years ago, hoping to see the Northern lights, but we were a bit early. I would love to go to Iceland. There are just too many places to see!!!! There really are. I never realized how big the world was until we set off trying to see it. The good news is that we’ll never run out of things to do. The next two years promise peak activity. Hmmm, too good to miss. Probably I’ll see you there, on the Arctic circle within the next two years. Who knows. “The mental images we develop of places we’ve never been are the first casualties of travel. Nothing is ever really how we imagine.” So true! Happens all the time be it Angkor Wat, The Parthenon or something as simple as the New York Skyline. I tend to blame the television and my tendency to google image places I am about to go more than my own imagination but yes I often wish I was stumbling upon these sights as a bumpkin. We went to Fairbanks, Alaska in the late 1990s just to see the Aurora Borealis. It was in March. The temps were beginning to get a tad warmer. We told the hotel clerk to wake us up if there was an Aurora Borealis. We didn’t care what time it was. Well, about 3 a.m. one night, we got the call. The greenish lights were just gorgeous. One night later, on the way back from a restaurant, whitish lights lit up the sky. Just amazing to behold. Go. Enjoy. Southeast Asia is a great destination where its easy to spend months, cheaply. But I have a hard time imagining taking cats there. Sadly, our cats won’t be making any more trips. Emma passed away two years ago and Tabitha within the last year. So sorry to hear that. But it does make SEA much more practical. Not to mention India and China. If you’re looking for heat you need to skip north Vietnam in the winter, but the south will be hot and humid. I think Cambodia is ALWAYS hot and humid, but worth it. Laos will be less humid. Lots of people love Thailand, me not so much, at least when it comes to Bangkok. Stunning!!! I saw them once – so magical!!! Enter your email address to follow EverywhereOnce and receive notifications of new posts by email. Fulltime wanderers since 2010, Brian & Shannon are traveling the world on a quest to see everything there is to see . . . at least once.